Madga Sayeg. You may not know her name, but if you're a knitter, I bet you are familiar with at least one of her works of art. This short video interview by the Wall Street Journal is so inspiring. I can certainly identify with how she talks about a small idea turnin big, going viral and becoming something outside of yourself. My Red Thread Project® started as a double dare from a curator to see if I could find a meaningful way to connect a university to the local town. 7,000 handknit hats later with emails from reporters worldwide, full samba bands and teaching over 1,000 children how to knit, the project cease to be an idea and took on its on reality. In other words, when you have an idea - go for it! 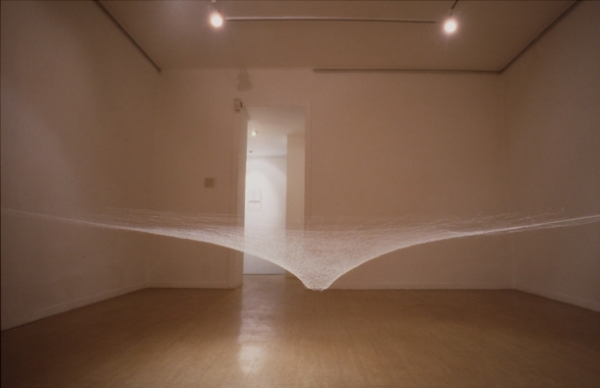 Japanese artist Akiko Ikeuchi's art is a delicate balance of knotted silk thread and air. Her installations are a finely tuned balance of weight and tension. These vortices reminiscent of whirlpools, hurricanes, and galaxies illustrate that life is strong, yet fragile. Her works are choreographed drawings, linear constructions exquisitely wrought and mapped with precision from precise blueprints. They play with light, density and opacity, visualizing its energy. At each juncture is a simple knot. Each knot holding to another knot and another knot until the image appears. and Music. Her work has been exhibited across Japan and Korea, as well as in Germany, Portugal and New York. materials and the manner in which something simple may become complex...like a single spool of thread. them from thread shows a deeper understanding of light and shadow as it moves across the form. equally drawn to the work of Gabriel Dawe. Color fills space like a giant version of Isaac Newton's experimentations in light diffraction. Threads run from one point to another, shifting through the colors of a rainbow. Nails, hooks and thread are his tools. installations are site specific, using existing architectural elements within the work. His use of stairwells are my particular favorite as the view changes from which vantage point you are at within the stairwell.